Detective is a cooperative game of deduction. Each of you plays an investigator with a unique ability and skill set. You must gather information, collect clues, and follow leads in order to solve a case, which is represented by a deck of cards. At the end of the game, you will answer questions to gain victory points. You will win or lose the game based on the number of victory points earned. 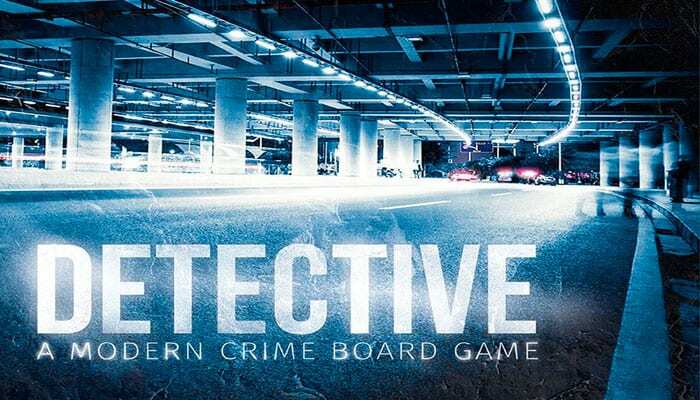 Detective is a cooperative game. All players share the Skill tokens, Stress tokens ( ), and Authority tokens ( ) in a common Token pool and use a Time marker to track the passing of time when resolving all Actions. We use the word "you" to represent the entire team. You are going to examine all clues together, as a team. 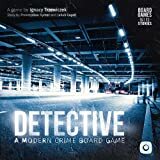 Detective is a campaign game. 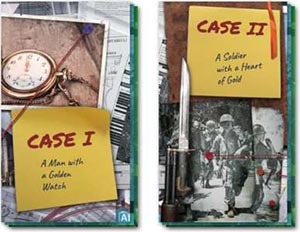 The five cases in the box are connected by one overall narrative thread. While playing, you might find clues that seem unconnected to the current case. Sometimes they are dead ends; sometimes they are clues you will need to solve upcoming cases. Each case is comprised of a dedicated deck of 36 cards: 1 cover card and 35 "lead" cards. Do not browse through this deck or shuffle it! Draw the appropriate cards from it only when instructed to do so. Read only the front side unless instructed otherwise. Once you draw a lead card, you can refer to it at any time during the campaign. 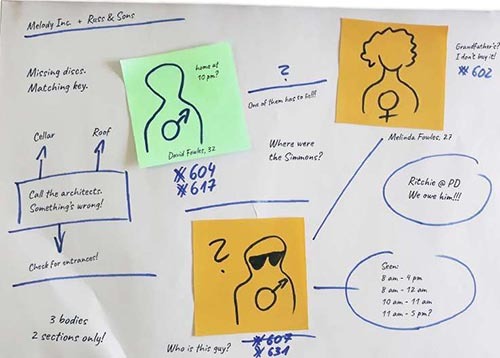 At the start of each case, you will find a few lead cards and clues to get you started .Consider following each of these leads before deciding to investigate further down any particular path. Following a few leads based on a variety of clues to build a wider picture of what's going on is often MUCH better than focusing on only one lead. With five interconnected cases in the base game, taking good notes will be crucial. If you start a later case without remembering vital names and clues from earlier cases, you will have a hard time piecing everything together. Do not hesitate to write down important names. Connect them with lines to show their relation to one another as well as to evidence , dates, places and events. In addition, we recommend creating a mind map to organize your thoughts. Each case has many paths to completion. Due to time constraints, you will never see the whole deck or discover all of the clues. In fact, the average number of cards drawn in each case is about twenty! After finishing the game, don't be disappointed that you didn't go through the entire deck. This is a game of deduction. Ultimately, what matters most is how you piece it all together, not how many clues you discover. Detective is not a "choose your own adventure" game. There is no final paragraph that says you won and sums up the entire story; no single card that makes everything click. All of the information is scattered among many different cards. You must connect the dots to build up theories and find answers to your final questions. Remember - no single card will win you the game. The answers for the Final Report must be deduced from the clues you have gathered during the game. You won't get far if you merely cycle through the deck, trying to draw one card after another, hoping that one last card in the chain will win you the game. It will not. 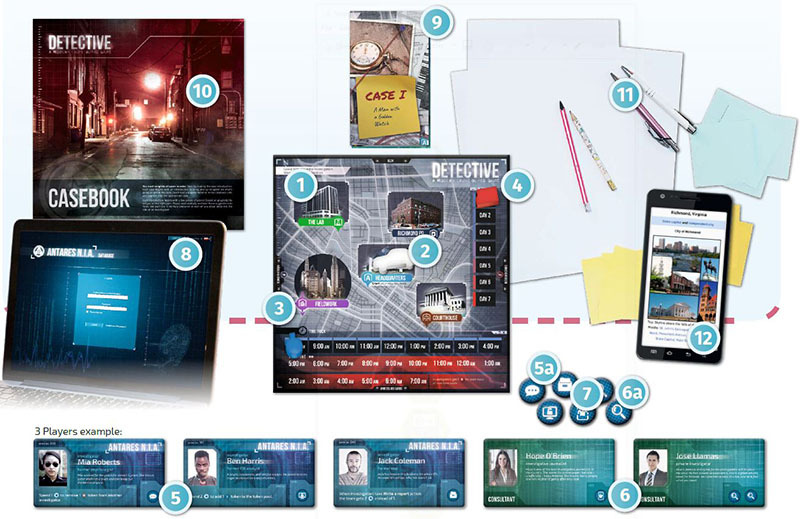 Detective is a game night experience and solving a case can take more than three hours. Since you will most likely play each case only once, don't ruin the experience by playing in a rush, in a bad mood, or under any other circumstances that will not help you fully enjoy the game. Find a good quiet place, maybe put some music on in the background, relax, and become a detective! The game board depicts all of the major Locations the investigators will visit during the game. It also features a Day track and a Time track to mark the passing of time, which is important because each case has a precise time limit in which it must be solved. 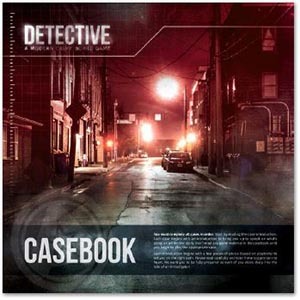 The casebook includes game introductions and special rules for each of the five cases in the campaign. Do not open the casebook before starting the game. Play all of the cases in order and don't read the next case until you have finished the current one. The Antares National Investigation Agency maintains a database of its resources at ANTARESDATABASE. COM. On this website you'll find witness reports, interrogation transcripts, additional materials dedicated to each case, and personal files of the primary characters you'll meet in the game. With investigators on the front and consultants on the back sides. Don't read or even open the next case deck until you have finished the current one. Used for various purposes (e.g. as an additional IT, Time or Day marker, as a spare, or to mark important lead cards). Unless instructed otherwise, you can use them as you see fit - be creative! 1 Place the board on the table within reach of all players. 2 Place the Investigation Team marker (or IT marker) on the Headquarters Location. 3 Place the Time marker on the 8:00 AM space of the Time track. 4 Place the Day marker on the day 1 space of the Day track. 5 Give each player the investigator tile of their choice. Place your investigator tile face up and collect the Skill token depicted on the tile in its bottom right-hand corner (5a). 6 Turn any unused investigator tiles to their Consultant side and collect the Skill tokens depicted on those tiles (6a). 7 Create a Token pool of all Skill tokens provided by investigators and consultants. 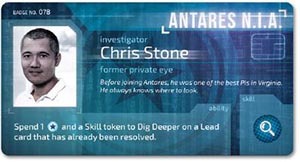 8 Log into the Antares website at antaresdatabase.com, then choose your campaign and the case. 9 Take the case deck and place it next to the board. 10 Open the casebook and read the introduction to the case, special rules, and set-up changes. 11 Make plenty of space for your notes and/or a mind map. Use a whiteboard or a bulletin board if you have one. 12 Make sure you have an Internet browser in reach to search for case related information. You have a limited number of days, i.e. game rounds, in which to learn as much as possible about a case and achieve the stated goal. Once you run out of days, navigate to that case's "Final Report" on the Antares website and attempt to answer questions related to it. Your answers will determine your final score. Each day is divided into eight working hours (8:00AM - 4:00PM) to spend on various actions. You can spend additional hours each day by working Overtime. Be careful, though! Working Overtime causes stress, and stress in Detective can end your investigation prematurely! During a Day, there are NO individual player turns or phases. You act as one team and perform actions together. You should discuss as a team the next steps you would like to take. Note that you may have to move the IT marker on the game board, move the Time marker on the Time track, and so on, depending on your choices. Perform another action defined by the case introduction or a specific card. Each action will indicate whether or not you must advance the Time marker to perform it. Example: You decide to draw and read a lead card, so you move the Time marker as instructed. That lead card gives you access to two new lead cards in the "Further Leads" section. You decide to draw and read one of the new lead cards, advancing the Time tracker again. There is an option to check something in the Antares Database, which you do (at no cost on the Time tracker). You now draw another lead card, but this lead is in a different Location, so you must first move the IT marker and advance the Time tracker by one hour, then you can read the card. Write down all possible leads to keep track of what is available to you. From our experience, taking a five-minute break after each day to stretch your legs, make some tea or coffee, or eat cookies helps to reset your brain for the next Day. This short break helps a lot with processing all of the clues and keeping your team focused. Lead cards represent crime scenes, witnesses, found evidence, and other information obtained during the investigation. Each lead in the game is represented by a single card and is identified by a # followed by a number (example: #103). You may only look at the front side when first gaining a new card. You may later be able to look at the back "B" side - but only when instructed to do so. Headquarters - Time-consuming tasks of obtaining information and doing extensive research are greatly sped up by the Antares system. These leads usually take one to two hours to complete. Interrogations may take longer. Richmond PD & Courthouse - Going through the archives is usually a time-consuming process. These leads usually take two to three hours to complete. The Lab - Cutting edge technology and information specialists greatly increase your efficiency, but nevertheless examining evidence can take up to four hours. Fieldwork - These leads are robust and can take you to many different places, but getting around town means that each lead card will take you at least two hours. Unless you're in a hurry. 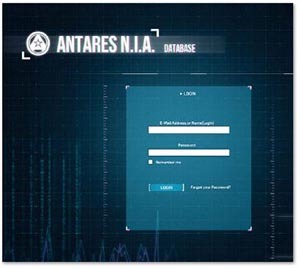 On the Antares Database (antaresdatabase.com), you can find information stored by the police, the FBI, the military, and federal intelligence agencies. When you encounter the "@" character, you need to choose the right section in the menu, then input the correct name or number. Read the Antares Database Guide for more details! Detective is set in modern times and you, as the protagonists of the game, have access to all data that can be found on the Internet. You can use Google Maps, Wikipedia, or any other source of data you may need. We call this mechanism "Breaking the Fourth Wall". General Knowledge is identified with the icon. When you see this icon, you can browse the given topic on the Internet to learn more about it. If there is a certain phrase underlined before the wifi icon, you should run it through the search engine of your choice to see what comes up. Solving a crime takes time. 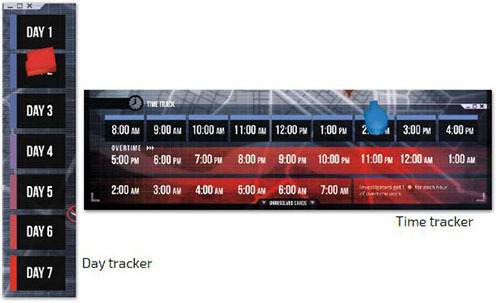 In Detective, the progression of time is represented by the Time marker advancing on the Time track and by the Day marker advancing on the Day track. Investigators have a precise time limit in which to solve each case, and each lead card has its hour value. When you draw a lead card, you must move the Time marker a number of spaces on the Time track as indicated by the card. Example: To resolve this card, you need to move the Time marker by 3 hours on the Time track. When the Time marker reaches 4:00 PM, work hours have ended. Unless you decide to go into Overtime, the Time token should now be moved to 8:00 AM and the Day marker moved to the next Day. Remove all Used Ability tokens ( ) from the investigator tiles. If you have finished the final day of your investigation, you have to finish the case by making a Final Report in the Antares Database; then read the epilogue based on your report. You can End your Day at any hour, thus starting the next one, until you run out of Days. You may choose to use the Overtime spaces on the Time track to continue working after 4:00 PM. In Overtime, continue to move the Time marker on the Time track to 5:00 PM and so on. You may use as many Overtime hours as you want, then (after advancing the Time track as needed to finish your actions) decide to End your Day. Add 1 (Stress token) to the Token pool for each hour you work after 4:00 PM. If you collect Stress tokens equal to or greater than your Stress limit (indicated in the case introduction), your investigation ends immediately, and you must go to the Antares Database to complete your final report. 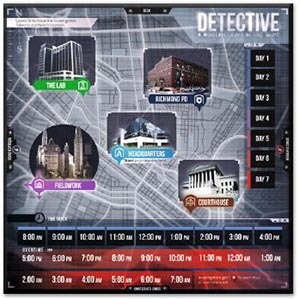 The Detective game board has five Locations. Headquarters is your office and the center of the whole investigation. The Richmond Police Department is a place where you can access files and evidence from old cases. In the Lab, you can examine evidence found at the crime scene. In the Courthouse, you can gain access to the archives and documents from old trials; you also have a few helpful consultants who work there and can give you important advice. Fieldwork represents all other locations in the city - its restaurants, parking lots, witnesses' houses - and other places, possibly all over the world. Move the Time marker one space forward, to represent the travel time. 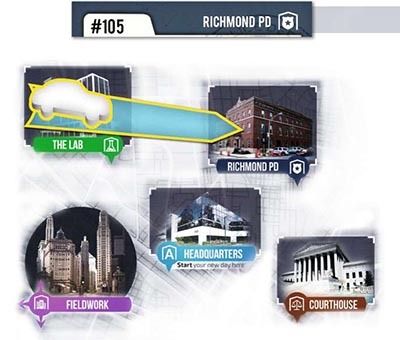 Example: Resolving lead card #105 requires investigators to go to the Richmond Police Department. Since investigators are currently at The Lab, you must first get there! You move the IT marker to the Richmond PD and advance the Time marker by one hour. At the beginning of each day, place the IT marker on the Headquarters Location. Some lead cards do not depict a location, which means that you can follow them from any location, without moving your IT marker. 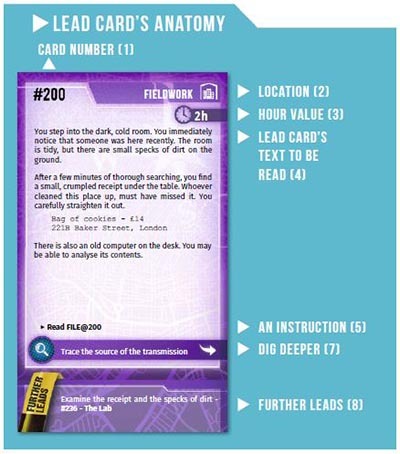 At the beginning of a case, the "Further Leads" section in the casebook will present a list of lead cards. You can Follow Leads in any order you wish, and you can ignore any that you don't wish to follow. However, once you draw a lead card, you MUST resolve it; you may NOT check the hour value and Skill required to Dig Deeper and then decide not to resolve the card. Search the deck for the lead card with the appropriate number. Check the lead card's location and move the IT marker and Time marker if necessary. Check the lead card's hour value and advance the Time marker an appropriate number of spaces. Read the card aloud and present its contents to all players. Make sure you keep the back side hidden (unless you are instructed otherwise). Follow all of the lead card's direct instructions. When you encounter a Signature, you must input it into the Antares Database, in the Signatures section. Decide whether or not to "Dig Deeper" if possible. If the card doesn't have this symbol: or you didn't Dig Deeper, place the card on the right side of the game board to remember that you do not have access to the back side of these lead cards. If you saw the backside of the card due to , Digging Deeper or other instructions, place it on the left side of the game board, which is where you can keep track of all cards that have both sides available to you. 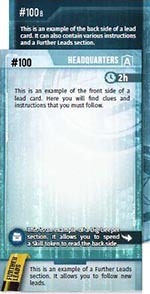 The "further leads" section on the lead card lists other lead cards you may decide to follow at any time later in the game. You must finish resolving the current card before following a new lead. This symbol means "turn the card over and read its back side", either after following some additional instructions (see Dig Deeper action) or for free. The "read" keyword indicates that you must immediately read the specified card or Antares Database entry. If you are instructed to read more than one clue, you may read them in any order. The "choose" keyword means that you have to decide which action to take from the options presented, mostly by following different leads or reading different clues. Once you make your choice, you cannot consult the other options; you must resolve the rest of the lead or follow any instructions given in the Antares Database entry. "Add a Plot Card" - Plot cards are a special type of cards that represent leads in future cases. You may encounter some additional, simple instructions that do not require further explanation. Some clues and instructions you encounter may require you to discard a certain number of O - Authority tokens. Lead cards are double-sided. 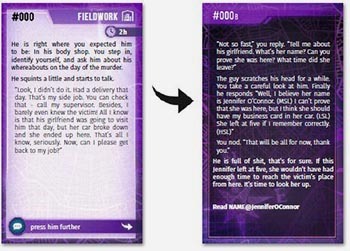 The Dig Deeper action allows you to reveal additional information by reading the back side of the lead card. To Dig Deeper, you must spend the token depicted in the Dig Deeper section of the card. After you do so, flip the card over, read it, note Further Leads, etc. Example: You Follow a Lead - a suspect questioning. The front side of the card presents the suspects' testimony. It is not very convincing; you are certain, that he is hiding something. However his alibi checks out. The Dig Deeper section gives you the option of pressing the suspect further. Are you satisfied with what you've learned, or do you want to Dig Deeper? When you have the opportunity to Dig Deeper, you must decide whether to spend the appropriate token or not. You have a limited number of tokens to spend during a case, so choose carefully. You can choose whether to Dig Deeper or not to Dig Deeper until you move on to Follow another Lead. In the rare case when you follow more than one lead card simultaneously, e.g., because of the Read keyword, you can choose to Dig Deeper after reading all of the lead cards you just followed. Digging Deeper is like following your gut instinct. You don't have to Dig Deeper on every lead. Sometimes this will lead to nothing interesting, sometimes you will confirm what you already deduced, and sometimes you'll learn new information! Never type numbers or names found during the investigation into the Antares Database unless specifically instructed to do so by the @ icon. Accessing the Antares Database never costs hours. 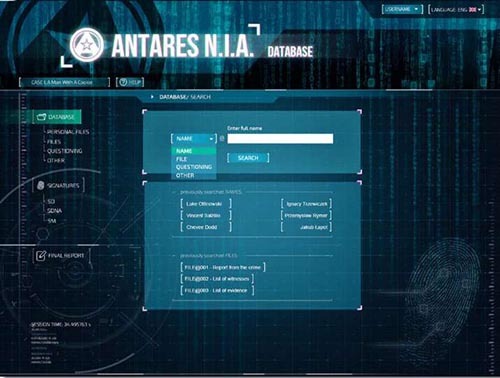 You can access the Antares Database at any time during the game, as many times as you want. When you are reading transcripts of previous conversations, the sophisticated Antares System may have evaluated the speaker's Stress Level for you, and the same nomenclature will be used. The higher the Stress Level, the more likely the suspect or witness is lying, hiding information, or otherwise reacting emotionally to the questioning. During the game, you will find underlined phrases with the icon. These may be addresses, quotes, names, dates, or other information that you can learn more about by browsing the Internet. None of these clues are necessary to solve the case, and you can finish the game without browsing the Internet. However, learning more about the given topics may help you understand the plot and some aspects of the case. You are free to use any resources you can find to follow the clues marked with the icon, including Wikipedia, Google, and Google Maps. You cannot search the Internet for information on a topic if not specifically instructed to do so by the icon. Once instructed, you can browse the Internet for clues on that topic at any time during the game, as often as you want. Browsing the Internet never costs any hours. Example: You can enter Karl Landsteiner into the search engine of your choice (or use more traditional methods, such as an encyclopedia) and learn that he was an Austrian scientist who developed the modern system of classification of blood groups. If there are persons of interest in your case and you have their blood type data, it would be wise to research this topic a little bit. See if you can learn something interesting about them! 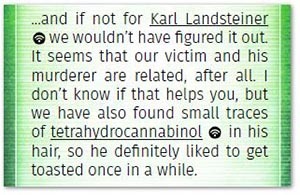 Separately, you can input tetrahydrocannabinol and confirm that the victim was a cannabis user. Maybe that will help you deduce some new theories! Each investigator has a special ability that can be used once per day. After using your investigator's ability, place 1 (Used Ability token) on your investigator tile as a reminder that it cannot be used again until the next day. Investigators can use their ability at any location. 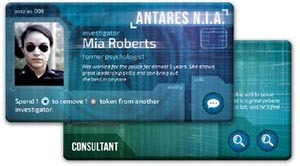 Note that Mia Roberts' ability allows another investigator to refresh their ability. Mia's ability can also be used only once per day. Once per day, you may spend one of your working hours at any location to Write a report in order to receive an Authority token. If you do, move the Time marker one space forward and add 1 to your Token pool. You cannot Write a report during Overtime hours. Each case grants you a specific amount of time (e.g., three days) to complete your investigation. The case ends at 4:00 PM (or later, if you decide to work Overtime) on the final day. Once you stop work and End that Day, you must log into the Antares Database and choose "Final Report" from the menu. Once there, you will complete a virtual report explaining the entire case, divided into two sections. The first section will require you to answer the main questions related to the goal of the case; the second section will contain additional questions, related to the metaplot. You will have to collectively discuss and decide how to answer each question. The answers to questions come from deductions that you have made during and after the investigation. Answers to questions are not on particular cards. Instead you must deduce them! Each case has a predetermined point total that you must reach to win the case. The main questions are worth the most points. Additional questions are worth the least points. You will automatically receive additional points for each piece of matched evidence you've entered into the Antares Database (worth more than additional questions, but less than the main questions). Additionally, you will be prompted to input the number of Stress tokens you've collected. For each you will lose 1 point. Once you complete your report, the Antares Database will automatically calculate your final score, then announce whether you have won the case. If you win, great; celebrate a job well done! If you lose, you can play the case again or move on to the next case. To play the case again, reset the lead deck to its original state; to play the next case, return all unused lead cards to the box and place all the lead cards you gained during the case in the dedicated spot of the insert. After the game ends, you cannot read lead cards that you did not draw! Each "I don't know" answer is worth 0 points. Each wrong answer is worth -1 point. It is almost impossible to score the maximum number of points for each case (e.g. some cases may require you to use Overtime hours).